WNYDA Welcomes you to Dressage! JOIN NOW! The purpose of the WNYDA Educational Grant Program is to provide support for educational programs for WNYDA members in the Western New York area. Each membership year from December 1st to November 30, the WNYDA Board will grant funds for up to three educational programs in the Western New York area. Grants may range from $100 - $1000 per event, depending on the funding required. Grants will only be awarded via an application process, presentation and approval by the WNYDA Board and will only be awarded to WNYDA members. 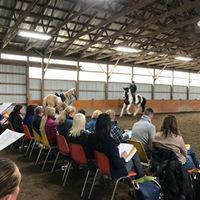 The grant may be used by adult amateaurs or professionals seeking to further their dressage knowledge through attending a dressage clinic or attending a dressage related educational event. Click here for Application information. Copyright © 2018 Western New York Dressage Association. All Rights Reserved. Connect with us on Facebook.